Immediately prioritized this book by a Haitian-American writer after reading about the "shithole countries" comment, and I'm so glad I did. There's so much going on artistically, it leaves you in awe even as it breaks your heart. Sophie grows up in Haiti with her aunt until age 12, when she is sent to New York City to live with her mother. It would be hard enough to live between two places, never having a true sense of home, but Sophie’s life is further shadowed by the painful knowledge of why her mother couldn’t raise her (which I won’t spoil here). Danticat explores how the legacy of violence and hurt are inherited by each new generation, and the herculean effort of will required to break those patterns. Even though thematically this is a tough book to read, the prose is spare and the pages fly. I never could decide if I wanted to speed up so the pain would be over, or if I wanted to slow down and let myself feel the impact. 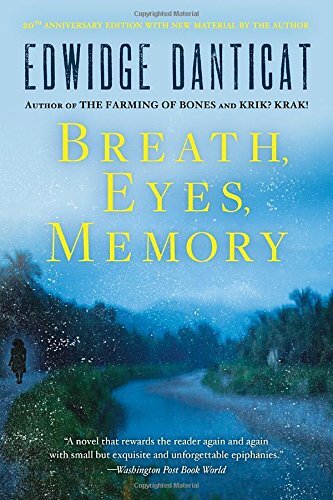 This is the kind of book you could read over and over and still not catch everything Danticat is doing, but I don’t think my heart could handle multiple close readings. At the back of my paperback copy, the publisher includes a note from Danticat addressed to her character, Sophie, in which she says she feels compelled to explain that not all children growing up in Haiti suffer exactly like Sophie does. Apparently some readers of the book have not understood that one character’s experiences from one fictional work cannot be generalized over the actual human population of an entire country. It created uncomfortable resonance when, after reading her eloquent response to the “shithole” comment, it occurred to me that Danticat is still, all these years later, having to explain herself to an audience of ignorants.